Congratulations to all Ensigns who were promoted to LTJG on November 20th! The time has come and CGC SHERMAN has officially left the Bering Sea! We are making our way back to homeport and will be there before you know it. While up north for an Alaskan patrol, a SAR-ready cutter is required to be in the Bering Sea at all times and the only available port call is Dutch Harbor, AK. With two back-to-back patrols up north, the SHERMAN crew has explored every nook and cranny of the island. While it may offer some scenic views, wild horses, a Mexican/breakfast/grill restaurant, and dumpster diving eagles, the crew is ready to head home. Legend has it that if you look at Priest Rock (which is at the entrance of the bay into Dutch Harbor) as you are leaving, this won’t be the last time you see Dutch Harbor. Let’s hope everyone kept their eyes forward! After a 20-month dry spell, our 76mm gun was fired! After much planning and preparation, the gunnery and fire-control divisions put together a successful shoot. In order to shoot the gun, you have to alert the area through a Securité broadcast. 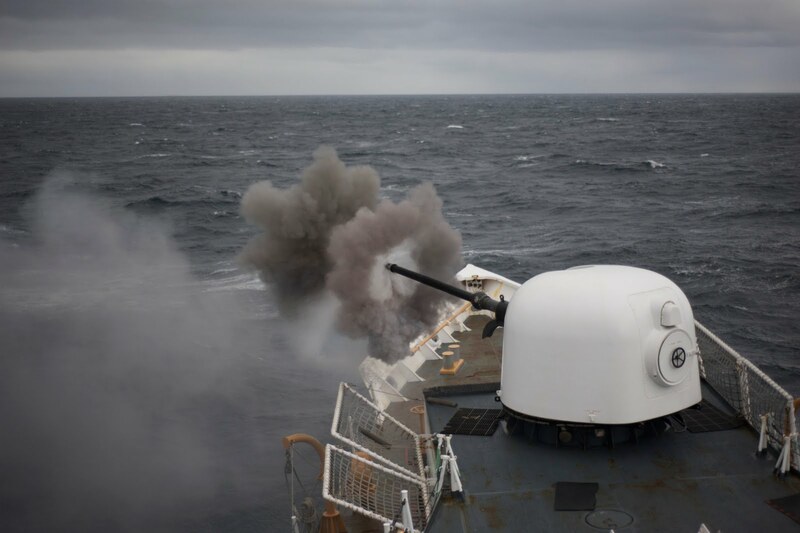 This message is broadcasted every 15 minutes, alerting sailors and aircraft in the area that in our designated position we are firing our gun including the maximum range and when the shoot was occurring. 29 shots were fired, giving the crew quite a spectacle. In order to facilitate the shooting, a large balloon (dubbed the killer tomato), is thrown off the ship and is the target the ship is aiming for when shooting. Overall, it was a very successful shoot! Congratulations to OS2 Elizabeth Wakefield for making Operations Specialist Second Class! Sherman has its own personal award that is picked by the Sherman crew for people who help out the ship and their shipmates to make the ship a better place for everyone. It is called the “SPIRIT OF SHRMAN AWARD”. The first award was given to OS3 Misty Snyder for helping with sailor of the quarter plaque. She updated the name plates on her own time so the crew can see their name displayed in gold. Just recently another member of Sherman received the award, SN Luis Orozco-Reza for designing two patrol t-shirts and drawing murals on the doors of the berthing areas. Spirit of Sherman award is a pin engraved with the SHERMAN crest which can be worn while underway. The SPIRIT OF SHRMAN is an awesome morale booster and a great way to promote the good deeds crewmembers and shipmates have done for the ship. CGC SHERMAN has been hit by some VERY rough seas as of late! Multiple low pressure systems have passed through the Bering and unfortunately we have been right in the thick of things every time. Up to 30ft seas and 40 knot winds were measured by quartermaster of the watch during the worst of it! Unluckily, we felt the blunt of it as the seas were coming off our beam (hitting us directly from the side of the ship), causing major rolls up to 25 degrees during the night. Needless to say, we were very happy to have a port call this past weekend to get some much needed rest and good nights sleep. Hopefully we can run and hide when the next predicted storm hits! Congratulations to all who advanced this October! Congratulations to all who advanced this September! USCGC SHERMAN (WHEC 720) is a 378 foot Coast Guard Cutter homeported in Alameda, CA. SHERMAN is over 40 years old and is still in active service. SHERMAN has around 160 crewmembers and this blog is a compilation of their experiences onboard.